DIYARBAKIR-Orphans Foundation has sent the aid to Bangladesh they have collected under the ‘Emergency Campaign for Arakan’ to distribute for Arakanese Muslims who expose genocide by the Myanmar army and Buddhist gangs. 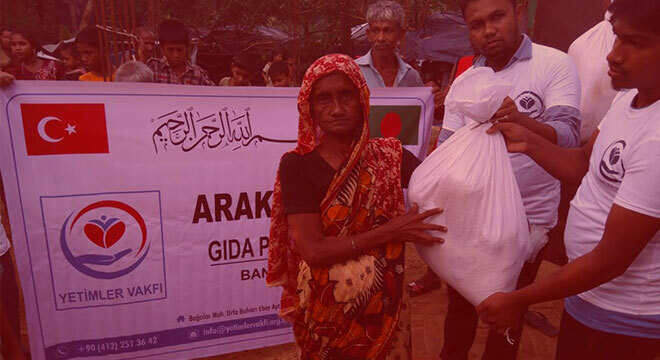 The Foundation distributed its first stage aid to Arakanese Muslims in live in tents in Cox's Bazar town located in Myanmar border. Foundation; distributed 500 food packages containing food ingredients such as oil, salt, potatoes, lentil, rice. Their assistance will continue, said Orphans Foundation Chairman Fikri Karavil in statements about the help they have done. Stating that that Arakanese Muslims faced with serious health problems, Orphans Foundation Chairman Karavil said the aid campaign will continue until December 14th.